I am Lynn Dee Galey and I have been passionate about gun dogs for 49 years. 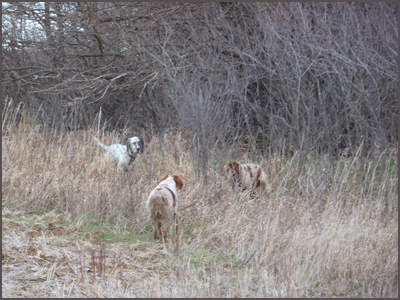 Since retiring several years ago I have been fortunate to life a traveling wing-shooters’ lifestyle with my setters. 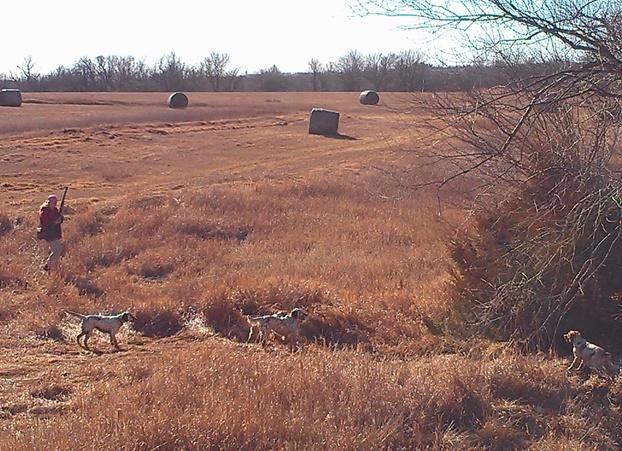 I spend much of my time wild bird hunting and travel thousands of miles across the country for hunting and to selectively breed an occasional litter from my best bird dogs. Although Vermont is my home, my homebase for the past 5 years has been Kansas with extended travels to Montana. 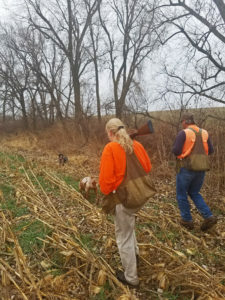 This has expanded my hunting beyond my roots with ruffed grouse and woodcock and I now equally love pursuing bobwhite quail, sharptail, huns and pheasant. I have found that the deep, woody smell of the forests is even sweeter after spending weeks on wind swept prairies. In earlier life I showed dogs for almost 30 years and finished numerous champions on the bench. I participated in and judged Hunt Tests and spent many hours in the saddle at my club’s field trials. I ran a training group at my farm in Vermont for many years with a focus on helping owners train their own dogs for hunting and for performance events. 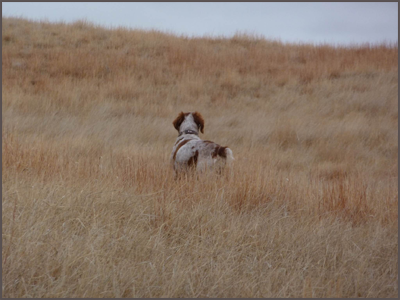 This varied history is the reason that I do care about what my gundogs look like as well as how they perform in the field: I want a classically beautiful setter that is an athlete and one with strong instincts to handle birds for the gun. 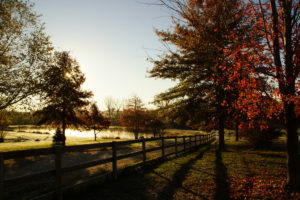 In the near future I am planning to move homebase back to the northwoods, with seasonal travels to the plains and prairies. And of course, I will continue to occasionally offer thoughtfully bred puppies for the serious hunter. I keep a small number of dogs (5 – 6) in my kennel and home so that I can give each dog plenty of individual attention and can hunt each one extensively to evaluate their natural abilities before considering them for breeding. 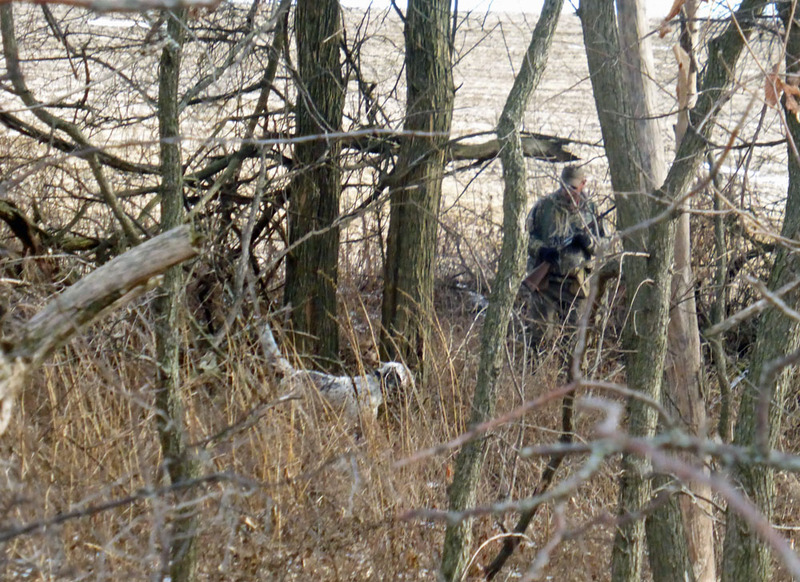 I believe that there is no substitute for lots of wild birds in the development and assessment of a hunting dog: I do not use any pen raised birds (except for perhaps intro to gun fire), I simply take our pups hunting when the season opens. All of my photos and videos are the dogs on wild birds; what you see in our photos is what I expect from them and what you can expect from one of my dogs. 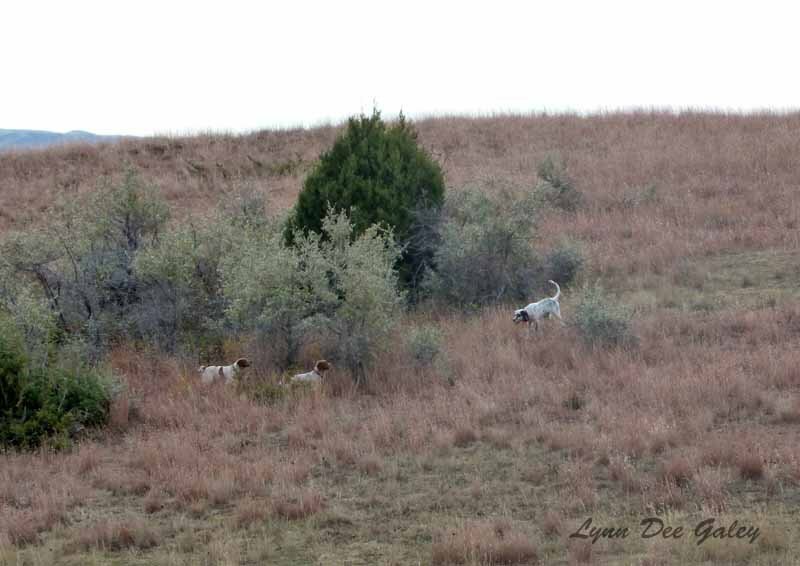 I hunt 60+ days a year across multiple states so that all of the dogs have the opportunity to prove themselves on a wide variety of habitats and bird species. From experience I have come to know that good bird dogs are able to adapt to and handle a variety of species. 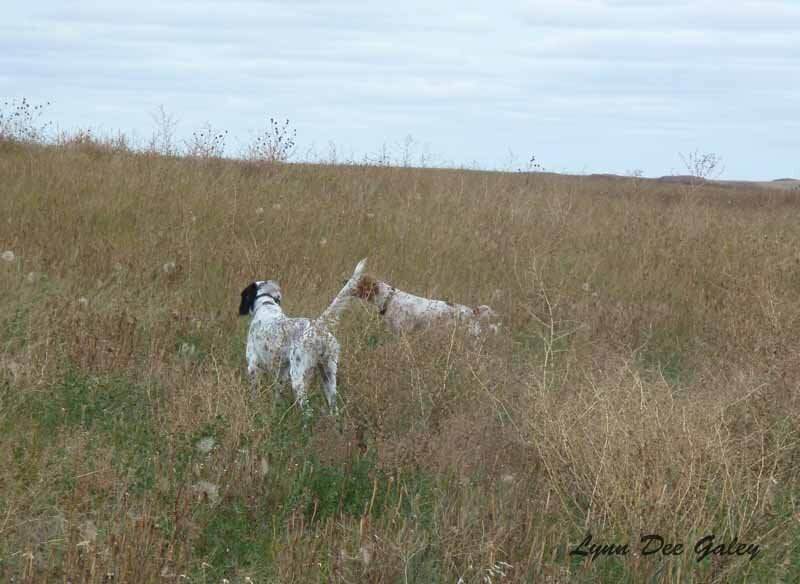 Training is simple everyday obedience and I have 2+ acres of fenced native prairie grasses where the dogs spend the days running and exploring together. I a ‘old school’ and do not use electronic shock collars in our training or hunting and although I acknowledge that they can be useful tools: I just personally want dogs that respond and work for me without such devices. I let the birds teach the steadiness lessons and just like the wild birds, I do not tolerate busting or “ripping” birds once a dog is no longer a puppy. I expect my dogs to staunchly hold birds until I arrive and I then flush and shoot. 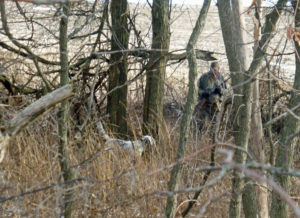 When hunting, they are expected to handle easily and to check in with a simple call or whistle. 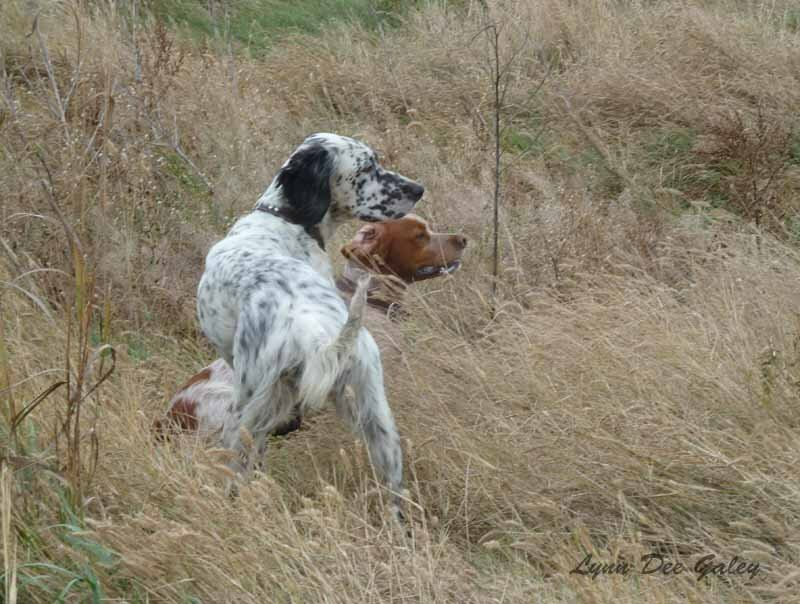 Don’t misunderstand this to read that the dogs are underfoot in the field, I want them to adjust their range according to where we are hunting. 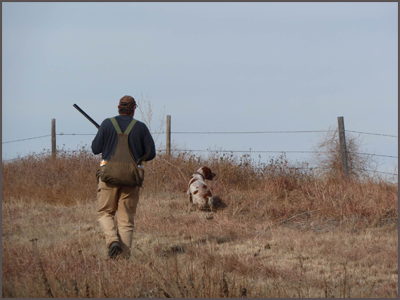 In open country such as in Montana grasslands this means that the dogs will roll 100-400 yards out. But when we hunt in the north woods for ruffed grouse, or thick brush and timber for bobwhite quail in Kansas, the dogs should close in appropriately. Are they always obedient and handle birds perfectly? Heck no, but then again, their owners and gunners aren’t perfect either but the dogs seem happy with us anyway and we are with them. I value the relationship I have with our dogs and the only thing I enjoy as much as watching dogs do what comes naturally to them in the field is meeting other people who share the same pleasures. I invite people who are interested in a puppy to join me in the field to see the dogs work and decide if it matches their own preferences. All of the photos on our site have been taken by me while hunting: I usually carry a pocket camera to stop and take photos before walking in to flush the birds, no need to rush. If hunting with other gunners I will also occasionally leave my gun in the truck and carry the DSLR to shoot better photos or video.